Here’s an early Paley Brothers recording session. They recorded at a loft in Soho called The Kitchen. This photo was taken during a vocal over-dub session. 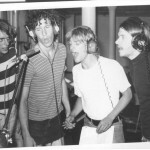 Left to right- Jonathan Paley , Ernie Brooks , Andy Paley , Arthur Russell.